Murder by Gaslight: He Knew Too Much. 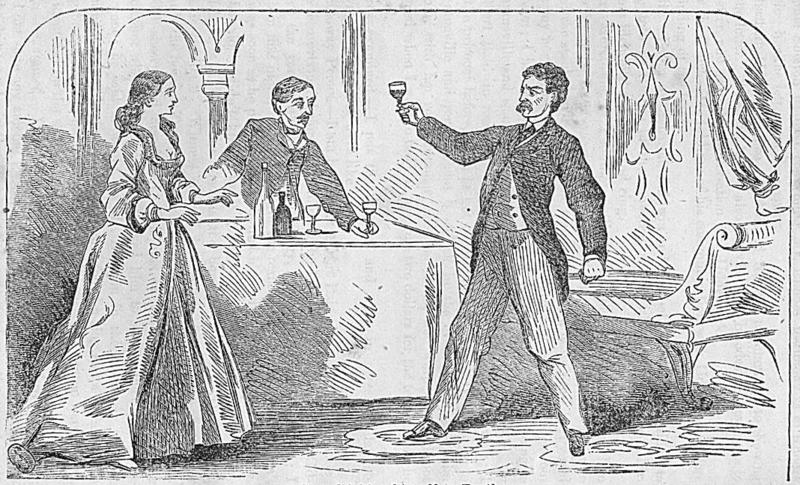 Winfield Scott Goss was a chemical experimenter with a well-known fondness for intoxicating spirits. When his workshop, in a cottage outside of Baltimore, exploded in February 1872, no one doubted that the badly charred corpse found inside was his. No one, that is, but the four insurance companies who had sold policies on Goss’s life totaling $25,000. They had many questions, and Goss’s friend and brother-in-law William Udderzook had all the answers. But rather than quelling their doubts, Udderzook’s “plausible stories” only fueled them—he seemed to know too much. The afternoon of Friday, February 2, 1872, Winfield Goss and William Udderzook went to the cottage that Goss rented for his experiments, trying to create a substitute for India-rubber. They stopped at a store near Goss’s workshop where they purchased a gallon of kerosene oil in a wicker-covered demijohn, and a bottle of whiskey. They also stopped at the home of a neighbor, Gottlieb Engle where they borrowed an axe to chop firewood. At dusk, Goss filled an oil lamp with about a quart of kerosene from the demijohn. About six o’clock Udderzook went to Engle’s house to return the axe. He stayed for dinner with the Engles, then he and Gottlieb Engle returned to the cottage to drink whiskey. The three men drank from the bottle Goss and Udderzook had purchased that afternoon and had been drinking for about an hour when the oil lamp went out. Udderzook tried to relight it using a candle, but the dripping paraffin made the wick harder to light. Engle proposed that they cut off a portion of the wick, and Udderzook suggested going to the store for a new wick. They finally decided it would be most expedient if they went to Engle’s house for another lamp. Engle and Udderzook went to Engle’s house, where they stayed for fifteen to twenty minutes before starting back with the lamp. They saw immediately that the Goss’s cottage was on fire. They watched as flames shot out of the window. No attempt was made to enter the burning building, but Udderzook sent Engle to Goss’s residence in Baltimore to tell his family that Winfield Goss had probably burned to death. About an hour after returning to the burning building Udderzook expressed concerns to Mr. Lowndes, the owner of the building, that Goss was inside the burning building. Lowndes was amazed that Udderzook had not given the alarm sooner. It was now too late to save Goss if he were inside; the roof and one wall had collapsed. As soon as they were able, spectators at the fire tried to ascertain if Goss had been burned with the building. They were able to pull out a body burned past recognition. Udderzook said he had visited every room in the cottage that afternoon and he knew there had been on one else in the house—the body had to be Goss’s. In telling the story Udderzook mentioned every possible detail and was ready to account for and explain any inconstancies. Four days after the fire, Winfield Goss’s brother, A. C. Goss, wrote to the insurance companies, relating the story of the fire and giving the coroner’s verdict: “That W. S, Gross came to his death by the explosion of an oil-lamp.” There were four insurance policies written on Winfield Gross’s life, all payable to his wife, Eliza. The first was for $5,000 written by the Mutual Life Insurance Company in 1868, the second for $5,000 by the Continental Life Insurance Company of New York in May 1871, the third $10,000 by the Travelers Insurance Company of Hartford in October 1871, and the fourth for $5,000 by the Knickerbocker Life Insurance Company of New York, in January 1872, less than a month before the fire. The insurance companies smelled a rat right away and began their own investigation. The investigators were troubled by a number of minor facts, which when taken together, seemed to indicate fraud. Why, for example, was a strong, athletic man as Goss was known to be, unable to escape the burning building? Mr. J. C. Smith, a junk dealer, searched the ashes of the cottage, for a watch and chain that Winfield always wore, raising suspicions when he was unsuccessful. A week later, A. C. Goss, the deceased’s brother, “made a thorougher search” and the found the watch, chain and keys. A. C. Goss also testified that he was home the night of the fire, but his landlady said he was not home for dinner and did not return until late. 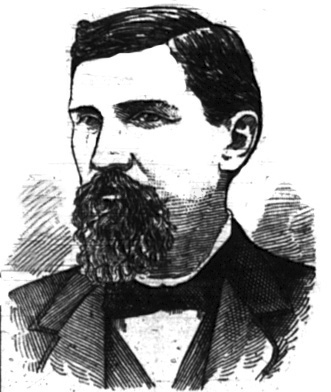 The proprietor of a livery stable identified A. C. Goss as the man who engaged a horse and buggy that night. The investigators now speculated that A. C. Goss had picked up his brother prior to the fire and taken him by horse and buggy to the railroad station; the person who died in the fire was not Winfield Goss. While they were not ready to charge anyone with fraud, they would not pay any of the claims unless the body could be conclusively proven to be that of Winfield Goss. Reluctantly, Mrs. Goss agreed to the exhumation of the body so the teeth, the only, feature of the body not destroyed past recognition, could be examined. Winfield Goss was known to have had a perfect set of teeth and had never been to the dentist for the smallest cavity. The body from the fire had a number of decayed or extracted teeth and the front teeth were irregular. 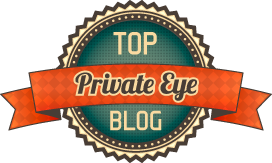 The insurance companies refused to pay the claims and Eliza Goss filed a law suit against them. The trial, in May 1873, lasted ten days and the jury found in favor of the plaintiff—the insurance companies must pay. Mrs. Goss, A. C. Goss, and William Udderzook were delighted with the verdict, but they were far from receiving payment; the companies filed a motion for a new trial and it would be November before that case would be heard. In fact, the insurance companies had been correct; Udderzook and the Gosses had conspired to commit fraud. The body in the house had not been Winfield Goss; it was a cadaver that William Udderzook had acquired. William Goss had been living in Newark, New Jersey, under an assumed name, since the fire, but the conspirators worried that with Goss’s intemperate habits and exuberant personality he would not be able to keep the secret much longer. On June 6, 1873, William Udderzook arrived at the hotel in Jennerville, in Chester County, Pennsylvania, accompanied by a man named Wilson. Udderzook was absent from the hotel the next day, returning in the evening with a horse and buggy hired from a neighboring livery stable. He settled the hotel bill and drove away with Wilson. Around midnight he returned alone to the livery stable. 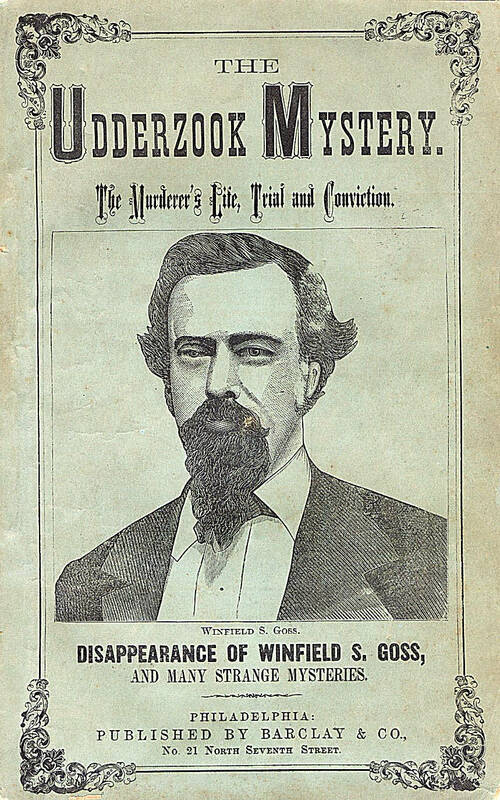 The body resembled descriptions of Winfield Goss and a ring found in the buggy hired by Udderzook was identified as belonging to Goss. William E. Udderzook was arrested for the murder of Winfield S. Goss. The prosecution retold the story of the fire at Goss’s cottage, and they had been able to trace Goss’s movements since the fire. He checked into the Central Hotel in Philadelphia under the name A. C. Wilson. Mr. Wilson’s handwriting was identified as identical to that of Winfield Goss. He boarded near Athensville where he pawned a finger-ring that was later identified has Goss’s. He then went to Newark, New Jersey, where he stayed until June 25 when he went to Philadelphia to meet the defendant. The two then travelled to Jennerville, Udderzook's home town. The prosecution then proposed to show Mr. Moore a picture of Winfield Goss to determine if he could recognize him as the man he found. Though the defense strenuously objected, the court allowed the photograph to be used. Moore testified that the man in the picture bore a strong resemblance to the man he found by the road. The jury began deliberation on the afternoon Friday, November 7 and returned a verdict at two o’clock on Sunday—guilty of first degree murder. The defense appealed the verdict on several grounds, most importantly that the court should no have allowed photographic identification, arguing that a photograph was twice removed from reality—the photograph is a copy of the negative which in turn is a copy of the subject—and therefore unreliable. The argument went as far as the Pennsylvania Supreme Court who set legal precedent by allowing the photograph as evidence. 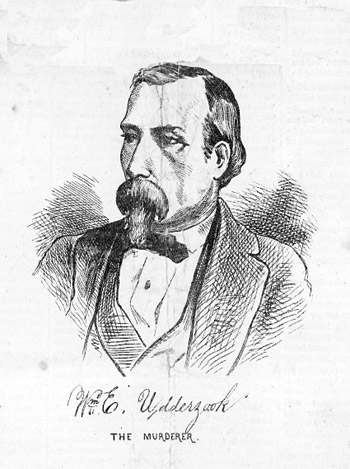 William Udderzook was hanged shortly after noon on November 12, 1874. He maintained his innocence to the end. Lewis, John B., and Charles C. Bombaugh. Strategems and Conspiracies to Defraud Life Insurance Companies: An Authentic Record of Remarkable Cases . 2nd ed. Baltimore: Office of the Baltimore Underwriter, 1896. Udderzook, William E., and George L. Barclay. The Udderzook Mystery! Containing a Detailed and Accurate Account of The Life of The Murderer, His Trial and Sentence, The Disappearance of W.S. Goss, ... Closely Bearing upon this Great Case Philadelphia: Published by Barclay & Co., 1873. Did the insurance companies then pay the policies to the widow? Was she ever suspected of being involved in the murder? I don’t know for sure, but here are my guesses: The Udderzook trial proved that the body in the fire was not Goss, so the verdict in the suit against the insurance companies would have been overturned. As a rule, insurance companies did not pay in cases of murder (though in the 19th century this varied from state to state and policy to policy.) I don’t think they paid. I couldn’t find anything implicating the widow in the murder, though she was almost certainly involved in the fraud. My guess is that after Udderzook was executed, as long as the companies did not have to pay, everyone was happy to just let it be.